Situated above the beautiful sandy cove of Cala Domingos, this hotel has two pools and a large sunbathing terrace with beautiful sea views. There's also an adult only bar making this hotel a great choice for both families and couples. It took us an hour twenty minutes for the transfer. But it was worth it. No road noise or screaming mopeds here as all the rooms have a sea view and the hotel is right on the front. The rooms were spotless and comfy. No setting the clocks here for the traditional scramble for the sun beds, as apart from the main pool area, there are two separate areas, one a grass tier and the other right on the front which was peaceful. We found the food plenty to choose from. There are a couple of microwaves handy as sometimes the food was not hot enough. No restrictions on drinks. We found the entertainment was poor on the night, but that seems the case in a lot of hotels. Would have to say this hotel is maybe the best 3 star hotel we have stopped in, and would recommend. Lovely 3* plus hotel with best loaction in the resort overlooking gorgeous turquoise sea and largest of the beaches. Food good quality and plenty of choice but some of the dishes could have benefitted from being kept hotter on the buffet. Snacks from bar and pizza/pasta are quite good too. Drink selection fine although only wine, juice or water available in restaurant so other soft drinks or beer had to be carried in from the bar if that is what you wanted. Rooms kept spotlessly clean with lovely sea views and have a TV with some english channels. Entertainment provided all day and until around 11 p.m. at night although I have seen better. Looked like people were reserving places around the pool areas at the crack of dawn and then there was a mad scramble at 9 a.m. to grab the sunbeds when they were unlocked. We avoided this by using the sunbeds on the grassed terraces leading to the beach, which was a very relaxing area with pleanty of shade available if needed. Transfer from and to the airport took just under an hour with Resorthoppa. Thoroughly enjoyed the holiday, I would return and also would recommend to friends. Hotel was very clean and tidy, with the rooms being cleaned and made up every day. Clean bathroom towels were provided on a daily basis. We also noticed the pool and patio areas being cleaned every morning. There are two large pools and a small childrens pool for the toddlers which were all excellent. As our first all inclusive holiday, we was unsure as to the quantity, quality and recurrence of the food that would be available. Any concerns were soon diminished, the food was very good with a great selection at each meal sitting within the main restaurant. There was always something to eat, and that includes for the children. Likewise, there were snacks available all day and a pizzeria which serves until midnight. Staff were friendly and helpful, although there was a distinct lack of staff serving at the bar in the evenings. Maybe this was due to the early date of our holiday? The location was pretty much perfect. Only a short 10 minute walk away from the resort centre, and literally two minutes walk from the lovely sandy beach and crystal clear blue sea (but the sunbeds are expensive at 10.50 euros a pair per day). The glass bottom boats etc. pick up just outside the hotel. A bus stop and land train stop right outside the hotel which was also very useful for a trip out. The evening entertainment was'nt brilliant but OK, let down by the venue as there are a number of support pillars that can obstruct the view. Kid's and adult activities were held throughout every day, which helped keep the kids amused when not swimming or playing in the pools. We would definitely go back to this hotel, in fact we are looking into it right now. best all inclusive we,ve stayed in by a long shot,only downside is drinking out of plastic cups, even at night.never ate out at all because the food was excellent,even at the snack bar .shame they allow smoking though in 1 of the bars.one tip,if you drink wine,take a couple of glasses out of the restaurant after your meal,because its not the same wine at the bars!good money to be won at bingo 237euros was the most when we were there. too many pillars in entertainment lounge so a restricted view of things going on.stunning views from each room apart from 168 which is on top of the dining room.overall a great 11 night holiday even though the wifes case turned up 2 days after we did,also the airport must be the worst in the world. we would definetly visit again. we have not long got back from a fantastic holiday here. the rooms were clean and tidy,and always were maids going round and made up your room when you wanted. the food available was lovely-always something for everyone-always replacing trays just before they were emptied so nobody went without.tables were always made up nicely with tablecloths always replaced.the staff were always friendly to my little boys and loved it when my lads spoke spanish. one of the staff did refuse entry to my husband one dinner time as he was wearing cropped trousers-however let a couple of blokes in the loudest orange shorts ever in as tehy didnt dare say anything to them-that was my only complaint though. the evening entertainment was ok however get there early if you want to be able to see it as like others have said there are alot of pillars to obstruct the view. will definately go back another time- recommended for families with younger children. Just return from our holiday at Hotel America. We had a fabulous time. Staff we're great, especially the bar staff and the cleaners. Room cleaned daily and towels changed when ever required.View from room beautiful. Breakfast was an absolute feast with plenty of choices, as was lunch and dinner. Pool area was cleaned frequently and hosed down every morning.Couldn't fault this hotel except it was a little diificult to find a table to watch the shows as big pillars obscured some of the preformance. But all in all very little to moan about would definately go again. Where do you start with this hotel, I have always beleived that the Reception staff should be accomodating as they are the first impression. Allas not so, hence their pride that the group has "30 yrs expericnce in exploiting" a freudian slip. We booked 2 rooms, as was given room 101, not what we booked - needless to say did not unpack.. after much dissagreement and intervention by Thomas Cook rep, we were told no other rooms we had to take the room or sleep where we stood, despite another guest having the keys to 6 other rooms. As good fortune befell us, I meet the guest and releived them of two keys and gave them the 101 (which they happily accepted, although informed me the next morning that its on top of the Disco, ha ha). Moving into our room with sea view can not complain, maids were in daily and can not complain, beds were made and towels changed. If only the resturant staff were as efficient, table cloths where invariably dirty.. Not enough larger tables for groups of more than 4, Breakfast was bland, lunch terriffic, and Dinner OK if you need to snach between meals there's reasonable pizza (ok for kids) and the pool bar for Burgers, sandwiches and tosties etc.. where service was always exceptional. As we are a beach family cant complain about the lack of beds arround the pool or lack of shade as we did not use, that said there was a terrible mess left every evening by the guest so gratefull that I was not sitting arround the pool but if you are there is a life guard and easy access to the unlimited drink! 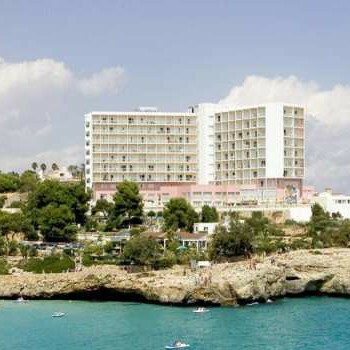 Go there expecting no sunbed arround the pool, OK food not great and a view to die for and you wont be dissapointed. Thank you to the Bar Staff for making it a great stay. just returned from a 10 night stay and found this hotel to be the best all inclusive we have stayed in .the hotel was spotless ,cleaned inside and out daily.there was a good choice of food which was available until 12.00 p.m.there are 2 good size pools which do not allow air beds [if only would ban water pistols as well].the hotel has an excellent location next to the beach and a stones throw from the town centre.only down side is the thin walls and the distance from the airport a taxi is between 70 and 80 euros.i would recommend this hotel to young families.